A quartet from the Harmony Hawks before delivering Singing Valentines, Feb. 14, 2018. The members of the quartet are Larry Hlavacek, Lee Freie, Scott Wilcox and Steve Aldrich. This year’s staging center for deliveries will be Gary and Linda Lindsay’s home, 4653 Northwood Drive NE, Cedar Rapids. No is the time to step up to sell Singing Valentines. Weather cancellations the past three weeks have set us back. We need everybody’s help right now! If you are on Facebook or your spouse is, share our Facebook event on your timeline. Go through your address book and send emails to those who might possibly be looking for a Valentines gift idea. Copy and paste this: Hey, I’m wondering if you’ve thought about sending ____ a Singing Valentine. People love getting these. Here is a link to the order form. Remember to fill in the blank in the above with the name of your friend’s sweetheart. Send only individual emails. Carry the Singing Valentine business card ad with you to give out when you meet people in social situations. This might also prompt a discussion of your hobby. Be ready for that. When you are out and about, scout for locations we can place our flyer and cards, and report back to Bob Handley about that. We are planning for three quartets to deliver this year’s Singing Valentines, Profound Sound, Timeless, and the Quartet to be Named Later. 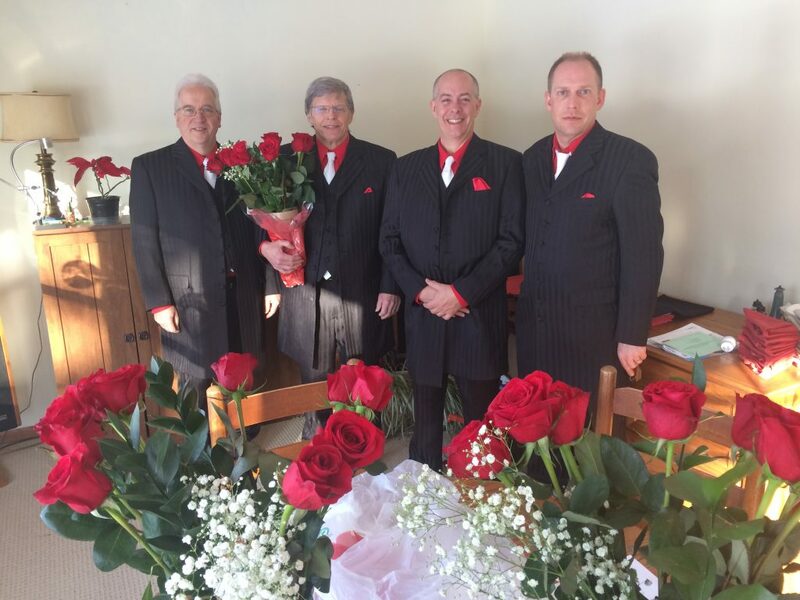 The quartets will meet at at 7:30 at Gary and Linda Lindsay’s home 4653 Northwood Drive NE, Cedar Rapids to organize for the day and pick up roses. We’ll have spreadsheets with your deliveries available then, and plan to send them out Wednesday evening for your advanced planning. Coffee and light breakfast items will be available. Bob Handley will be stationed here throughout the day to take calls and direct the quartets. 7:20 Sectionals, “I Wish You Love,” measures 1-48. This entry was posted in Board and staff notes. Bookmark the permalink.